Welcome! Please see our "News" page because there are lots of GReat things happening with Sharella Goldens. Golden Retrievers are wonderful companions. Each one is so very special and we dedicate this website to our love of them. We now have five Goldens, Summit, Trufle, Mariah, Code, and One. Mariah, Code, and One are Trufle's puppies. We have had Golden Retrievers since 1993. Our dogs are first and foremost LOVED FAMILY MEMBERS. We enjoy training and participating in obedience, show, rally, and field work with our dogs. We believe strongly in adhering to the breed standard especially from a health and temperament point of view. 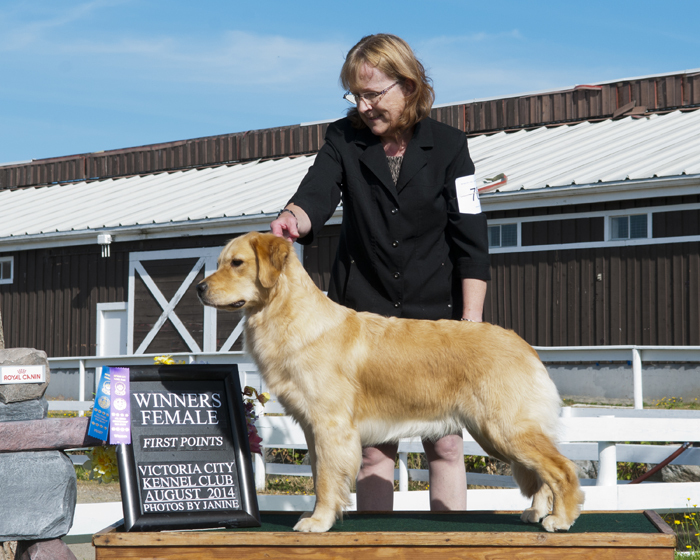 We will not breed unless a dog gets required health clearances, meets the breed standard, AND has the excellent temperament Goldens are expected to have. We expect the dog to have earned some CKC or AKC titles before breeding as well. If you'd like more information about Golden Retrievers please contact us . We live in Nanoose Bay on beautiful Vancouver Island. We have always loved dogs. In fact, our kennel name came from the love of our first two dogs. Years ago we had two dogs that lived to be 17. One was an Airedale/Doberman cross named Cindy (Cinderella) and the other was a Labrador named Sasha. We decided to remember our first dogs by using a combination of their names in our kennel name. Hence . . . Sharella (Sasha, Cinderella). Please visit our namesakes page in their honour. We are members of the Canadian Kennel Club, Golden Retriever Club of America, Nanaimo Kennel Club, and Golden Retriever Club of B.C.